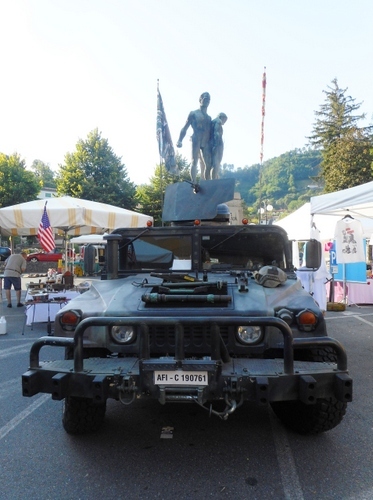 Last Sunday, the centre of Bagni di Lucca Villa was again filled with second-hand stalls selling a very wide assortment of goods ranging from clothes to radios to magazines and plenty more. It was part of the ‘soffitte’ which literally means ‘attics’. It was, in effect an attic sale, although some stall-holders were also selling some new objects as well. The event was also a good occasion to keep some shops open. 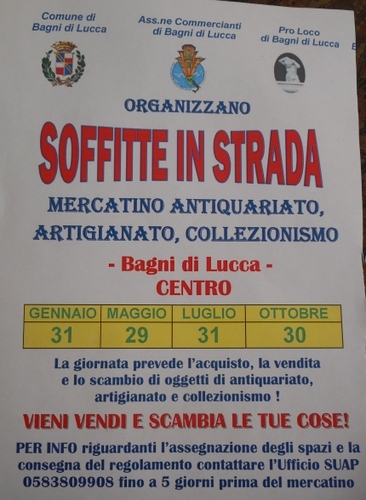 (There are hardly any shops open in Bagni di Lucca on Sundays except the two mini-supermarkets). I enjoy these sales very much and they have become increasingly popular. These ‘soffitte’, in my opinion serve seven main purposes. They are the best way to recycle things which otherwise might finish up in some tip. They can supply extra income to cash-strapped Italians today where people living below the poverty line are regrettably increasing. They can offer bargains to those persons who would like to buy such items as kitchenware, cutlery, glasses, plates and clothes. They bring in visitors from an increasingly wide part of the Lucchesia and thus serve to publicise our beautiful area. They are great social centres. The number of acquaintances and friends I met last Sunday was very encouraging. They allow more living space in one’s house by getting rid in a constructive (and often profitable way) of unnecessary clutter. An inability to throw away possessions including items too big or too small for one’s proper use. A severe fretfulness when attempting to discard items including such things as used toilet rolls and goods wrappings especially polyurethane. An enormous difficulty in organizing one’s possessions or even knowing where they are. Much of the time things seem to have disappeared in a domestic miniature black hole. Hesitancy about what to keep or where to put things. Distress, such as feeling stunned or embarrassed by one’s amount of possessions so that visitors to one’s house are discouraged. Suspicion of other people touching or stealing one’s things. Fear of running out of an item in the future and checking the rubbish bins for accidentally discarded objects. A typical example is over-buying supermarket food and then having to throw it away because it’s gone bad. The success of rental storage space warehouse in cities where living space is becoming ever more diminutive is a symptom of this difficult-to-cure disease. Some celebrities realised they had too much and took appropriate action. Elton John, for example, gave away the majority of his record collection. I try to counter any symptoms of disposofobia in me. I am attempting to refrain from buying yet more books since, I regret, I still suffer from bibliomania, which is a sub-species of the awful disease. I’m trying to get round it by getting books on an e-reader but it’s not quite the same thing as turning nicely scented pages in a good binding and perhaps a bibliomaniac I shall always remain. I am very frightened of being an animal hoarder which is yet another subspecies of the obsessive-compulsive disease called disposofobia. I have stuck to three cats, two ducks and two goldfish for at least two years now so I trust I have that aspect under some sort of control. One thing I do not suffer from is polygomania. One wife is enough for me and I shall always remain happy that way. Last Sunday a major event took place at Bagni di Lucca as part of Lucca’s Napoleonic circle celebration. Around eighty persons in period costumes descended upon our town. Starting from the Circolo dei forestieri they walked up to the Villa Webb (whose past guests included Byron). By some regrettable fluke I was not present and, indeed, the event was not publicized at all widely. Not even the local pro-loco web site, which is normally quite good in these matters, listed it. There were, in fact, many more people in costume than those watching them. Where was I? I’d returned to Ponte a Serraglio at 2 pm only to be greeted by a violent hail storm and decided to get home as fast as possible The weather, however, did clear up in time for the pageant to proceed. I heard eye witness accounts from a friend living in Bagni alla Villa who said that the dresses worn were particularly exquisite. Rather than deny the pleasure of any of my readers I am presenting photographs of the event by permission of pro-loco chair Valerio Ceccarelli. This occasion, which should have celebrated the Napoleonic connections of Bagni di Lucca, was clearly one of the grandest event for the comune for some time but it was, regrettably, poorly advertised and even more poorly attended. It’s quite a shame for a place where Bonaparte’s sister, Elisa Baiocchi, princess of Lucca, had her summer palace and where the casinò, the first in Europe to be established, was attended by the most distinguished guests of a past age. Evidently, the empire-style guests moved on to parade themselves in Barga before returning to Lucca where a grand ball was held with over one hundred costumed participants and dancers coming from all parts of Europe. There was a complaint from some residents that the turn-out to watch wasn’t as wonderful as it should have been and that a toast should have been offered and that a local band playing the Marseillaise would have been welcome. However, it’s clear that those attending, both as participants and as spectators, enjoyed themselves. May this event be repeated as soon as possible so that I, at least, won’t miss it the next time! The wonderful thing was that all the dresses with very few exceptions (like some replacement repairs) were original local 1950’s vintage. It’s amazing what one can still find in one’s wardrobe or the charity shop. Last year’s theme was women’s nightwear. This year was more upbeat and concentrated on American influence on fifties’ Italian youth. The show opened with two Italian girls, dressed soberly and primly, as new immigrants to the States. Then the transformations occurred: high heels, red lipstick, silk scarves, slacks, polka-dot dresses, pony tails, charm bracelets, bobby sockers, and bright colours, lampshade hats, flounced up highly petticoated twirling skirts. Even accessories like jewellery and Edna Everedge type glasses were original and used to great effect in the show. Blue jeans made their first appearance too! Technology entered into the fray too. 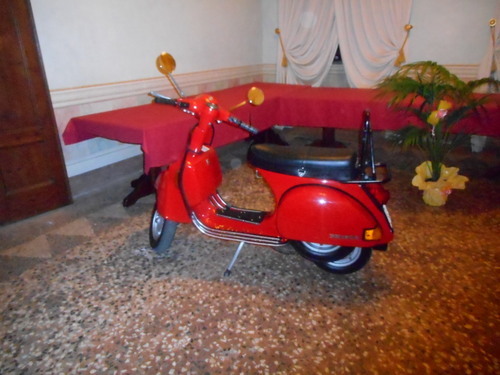 The Vespa changed Italian courtship patterns into something much more liberated. Shades of ‘Roman Holiday?’ What wonderful times! Considering that none of the local models were professionals I was enchanted by the way they fell into their roles, no doubt encouraged by our creative couple from Shelley House, which opened in Bagni di the end of last year. Certainly, actress, poet and stage director Rebecca Palagi had a very considerable effect, not just in her immaculate presentation, but in her choreography of the evening. 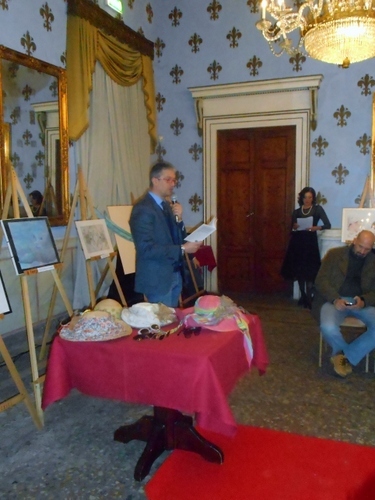 Luca Guidi provided a couple of more serious spots by reading passages from Mary Shelley’s letters describing her life in Bagni di Lucca and then those awful days when she discovered her husband Percy had been drowned near La Spezia. The grand finale consisted of a parade of 1950’s wedding dresses and these provided a romantic conclusion to an age which was characterised by a very hopeful mood that the world could only get better. We need that 1950’s optimism now more than ever but it’s too often so elusive to find. After all, the pursuit of happiness still remains for so many of us the ultimate quest in life and that happiness can only be achieved by emphasising love of humanity and our world. There was certainly happiness on Wednesday evening at the Casinò. And next year we’re promised the sixties! Maureen Halson, the internationally regarded figurine sculptress whose beautifully studied creations are works of art on the highest level, decided this year to make a truly big statement, not just about her art but about women. Gone are the days of gender-separated toyshops. Why shouldn’t boys play with dolls and girls play with Action man? 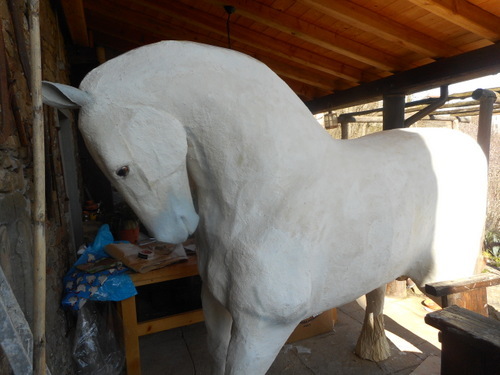 ‘My little pony’ has become ‘My big stallion’ and Maureen, through her sheer professionalism, has created something Bagni has not seen for a long time, perhaps ever! It’s a statement not just about her art but about the politics of gender. Hearkening back to mediaeval times when such horses were used not just for transporting knights in armour together with their bassinets, shields and lances but also for hauling tree trunks (they are still used for forestry work today) shire horses were later used, like HGVs today, to transport heavy essential loads. 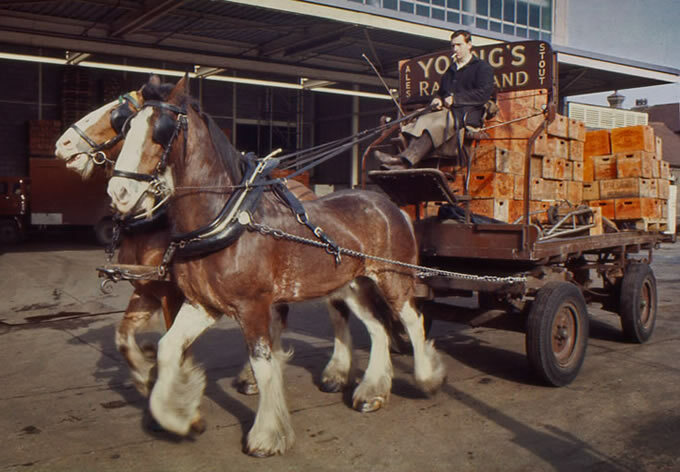 I’m old enough to remember such essential loads being carried from Mortlake brewery by a pair of these wonderful beasts. The beer never tasted quite the same again after the brewery decided to change over to motorised transport in the 1980’s. 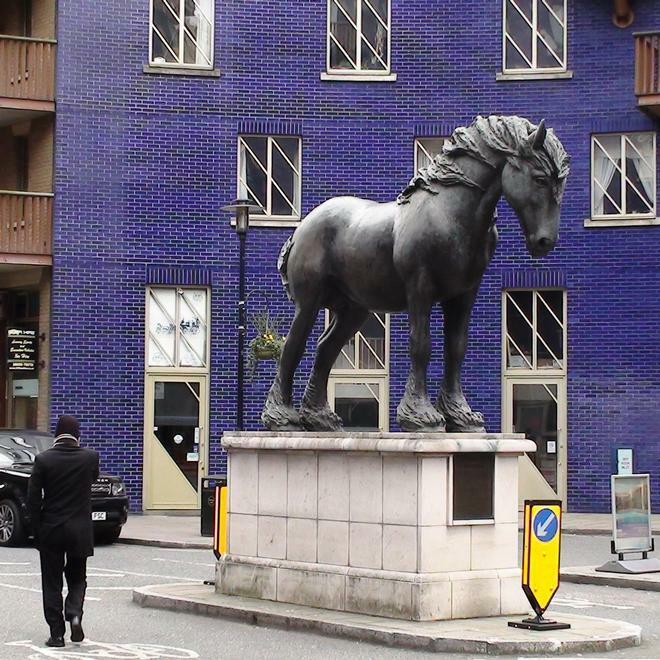 Regrettably, the only shire (or dray horse) to be seen in London today is that lovely statue to Jacob, who worked for the Courage Brewery near Tower Bridge (in fact, the whole area is known to this day as Horsleydown, = ‘Horse-lie-down’, a place where horses could rest and have a hay-break). We would often make a slight detour on our motorbike to circle round this horse that faithfully brought liquid joy to the mouths of thousands of parched Londoners for so many years. 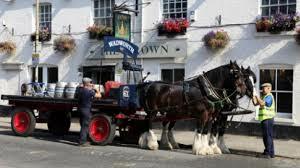 I believe that if you visit the Wadsworth Brewery in Devizes Wilts you’ll still be able to catch the wonderful shire horses delivering their wares. Anyway, let’s get back to Zesty Ziggy, which Maureen modelled using papier-maché over a chicken wire frame (very much like the float displays at Viareggio’s carnival). 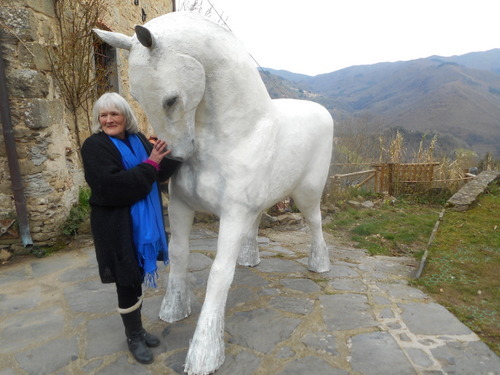 We had to transport the magnificently virile beast down from high-above Granaiola to Bagni di Lucca Ponte’s Casinò in time for tomorrow’s opening of the week of celebrations, ‘Omaggio alla Donna’, for International Women’s day which is on March 8th. Coordinating a goodly team consisting of Silvano, truck-driver and master-builder, myself and some locals we managed to lure Zesty to the truck, tucked him in rather unceremoniously on his back, fastened his various safety belts round about together with some sundry cushions and took him down the winding mountain road to the banks of the Lima River. Now, as the saying goes, you can lead a horse to water but you can’t make him drink it. That wasn’t a problem, however, with Ziggy. Zesty headed instead for the grand ballroom of the casinò where he now stands proud and erect (in more ways than one) before the orchestra stand. If you are a woman (or even a man) don’t forget to attend the grand opening tomorrow, Sunday, at 5 pm at the Casinò. 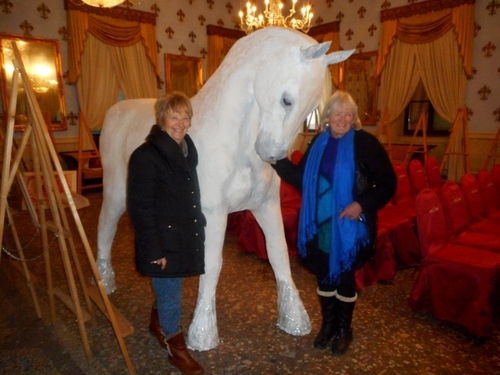 See you there and have your picture taken with the biggest and most beautiful creature in Bagni di Lucca! If there is more than one of you photographing a pageant in Italy (or anywhere else for that matter) then it’s a good idea to split up on the processional route so that different aspects of those participating can be obtained. I’m glad she managed to get the birds more successfully. Many of these magnificent raptors had their hoods on. These leather head covering are used to hide the stimulus of the world from the birds’ sight and calm them, somewhat needed on this occasion! Also Alex caught more of the lords’ and ladies’ costumes. It’s amazing how the persons taking part turn into those very characters one sees in such frescoes as Ghirlandaio’s in Santa Trinita. Florentine facial features can’t have changed that much at all in six hundred years! What great effort must have gone into making these costumes! The question to ask about one’s car is not so much when it will break down: this is surely bound to happen at any inopportune moment according to Murphy’s Law but where it will break down. Although our little road from Bagni di Lucca to Longoio is not of the same calibre as some dirt track in the upper Mongolian steppes it’s still a little scary when the car suddenly conks out on a stretch of narrow unsafety-barriered road verging onto a ravine in pitch darkness just before a bridge and a couple of bends, with pelting rain and mountain fog to add. It’s even more worrying when a new battery has just been installed in the car and suddenly refuses to provide energy. The problem revealed itself when the red generator ‘spia’ or warning light was switched on. The battery wasn’t charging and with lights and wipers on the engine died rather quickly. Fortunately, this time the rescue van arrived in a little under an hour’s time. With a special booster the battery was recharged and our little Cinquina sprang into enough life to get us home. Grazie ACI! The following day, however, we had to sort out why the dynamo wasn’t working. 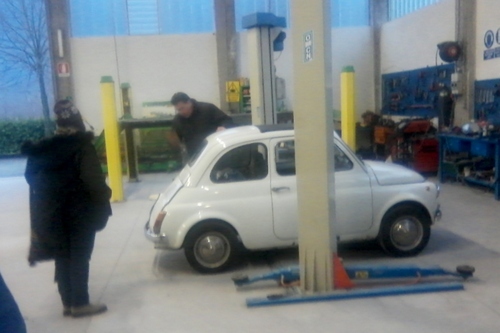 We took the car down to our trusty mechanic, formerly near Conad in Bagni di Lucca but now in a smart new warehouse at Pian di Coreglia. I’ve mentioned our mechanic at my post at https://longoio.wordpress.com/2013/07/04/cinquina-bambina-mia/ and have now updated his address in that post. The dynamo brushes were well and truly worn out and the whole unit had to be dismantled and new parts found which, fortunately they were, cannibalised from other parts. It would be a two hours work, however, and what were we going to do in the meanwhile? The hairdresser certainly took our mind away from the delicate surgery being inflicted on our Cinquina’s dynamo and my wife especially was well pleased with the results. The advice given was excellent and the price which included shampooing was very reasonable. We exited from the venue as transformed people and hoped our car would emerge, in its own manner, in the same way. Success! The reconstructed dynamo worked and was now able to charge the battery. In fact, last night it took us to the circus (more of that later). So don’t moan if you’re stuck at a mechanic’s garage for two hours in a remote location: there could always be hairdressers nearby!